Check our video press release here! Did you know the color of fruits or vegetables can tell you the vitamins and nutrients they have? HueTrition creates a healthy lifestyle change that lasts. How is HueTrition different? It is the simplest and most fun way to eat healthy! 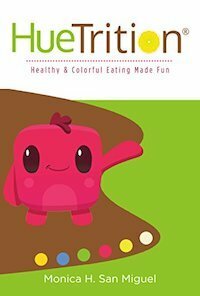 It is NOT a diet, but if you or your family have been struggling to eat enough fruits and vegetables, or if you are wondering how to shift to a more plant-based way of eating, or if you just want some new ideas to incorporate nutritious color into your lifestyle, this is a great book for you! You’ll learn how to substitute your snacks and side dishes with colorful vegetables. The more you do this, the more you’ll notice improvements in your energy levels and weight—but more importantly, you’ll be on your way to fool-proofing yourself against chronic disease (coupled with regular physical activity, of course)! You can purchase the ebook right here!